We’ve got some incredibly talented contributors sharing work with us. 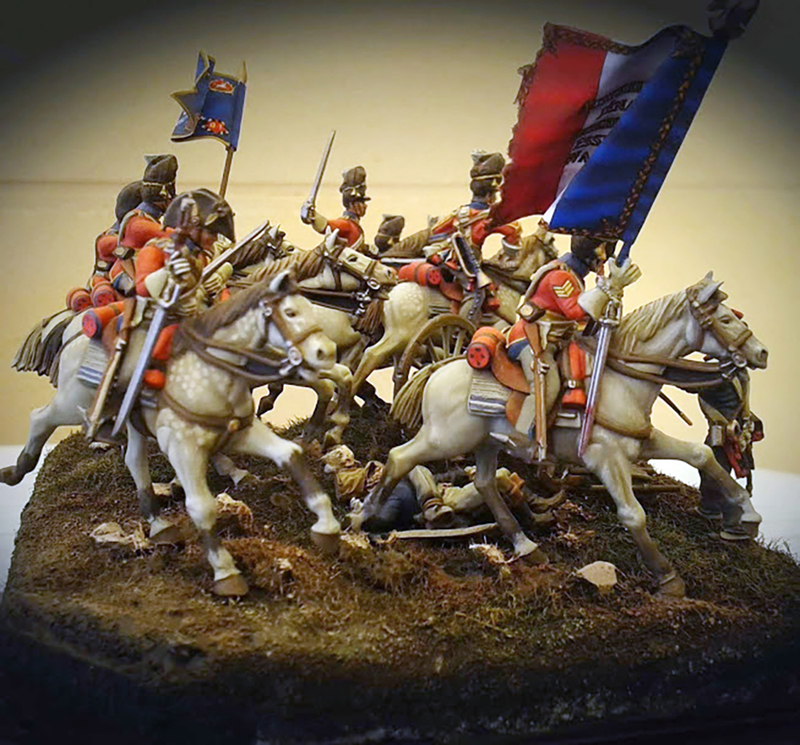 This week, we’re featuring Luis García Balaguer’s fantastic diorama of the Scots Greys at Waterloo. Sergeant Charles Ewart captures the French eagle. 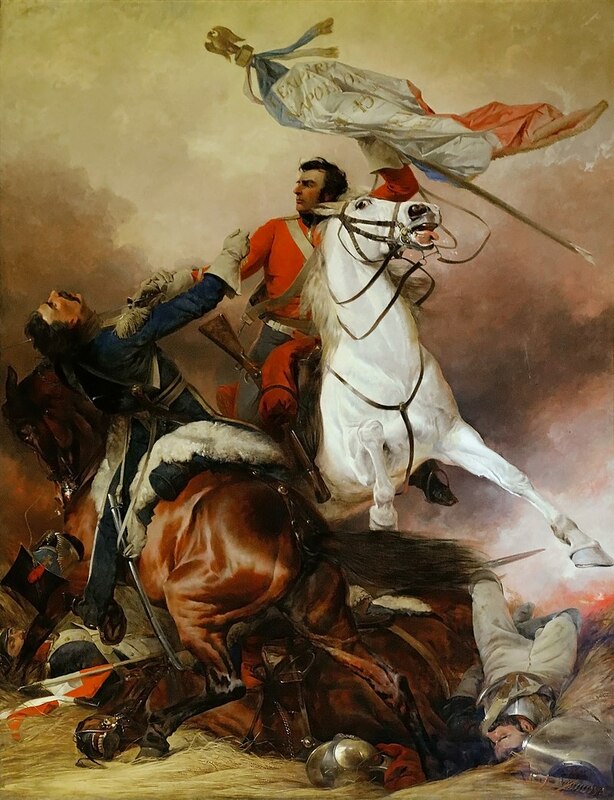 On the morning of Waterloo, the Scots Greys found themselves in the third line of Wellington’s army, overlooking the centre of the British lines. While the rest of the British heavy cavalry was launched against D’Erlon’s Corps assaulting Hougoumont and La Haye Sainte, the Scots Greys were kept in reserve. Their commander, Lieutenant-Colonel Hamilton, watched Pack’s brigade of Highlanders begin to crumble under a massed French attack. On his own initiative, he ordered his men through the retreating Highlanders and straight into the disordered French infantry. Captain Duthilt was in the ranks of a French column driving into the 92nd Highlanders at Waterloo when the charge of the Scots Greys hammered home. These men were the elite of the British cavalry, mounted on massive war horses. Without the protection of a square, the French infantry was acutely vulnerable and collapsed under the weight of the cavalry charge. With their opponents in disarray, the Scots Greys pressed home their attack and sabred their way into the centre of the column. Sergeant Charles Ewart found himself in striking distance of the French eagle and launched a heroic assault on the French infantry defending it. After hammering through the French infantry, the Scots Greys lost cohesion with small bands of troopers dashing off after the fleeing infantry and undefended artillery crews. The cavalry were scattered across the valley floor between La Belle Alliance and Hougomont when the French counter charge, composed of bloodthirsty cuirassiers and lancers, hit home. Badly mauled, the British cavalry were driven back up the hill. 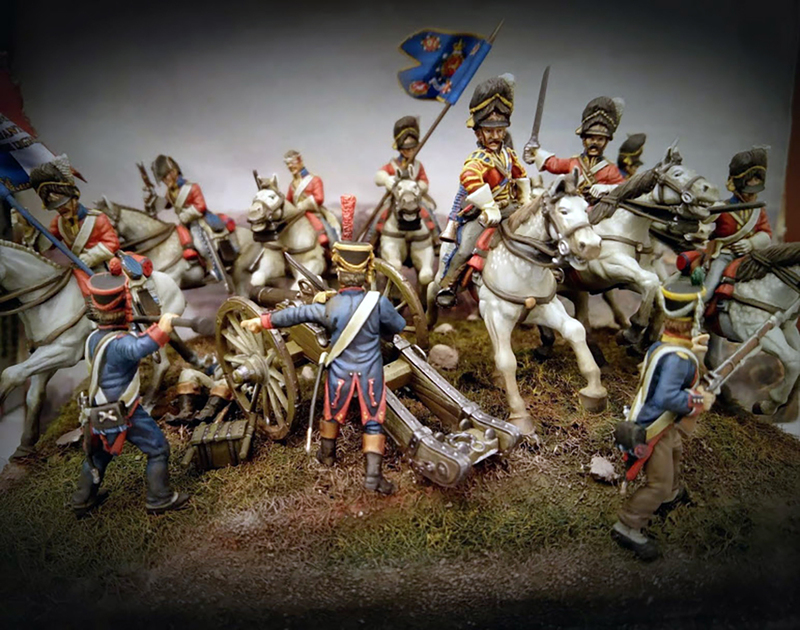 This fantastic diorama, produced by Luis García Balaguer, showcases elements of the Scots Greys as they overrun a French artillery position. The whole diorama seems to come alive, heaving with implied motion from the charging cavalrymen and recoiling artillery crew. 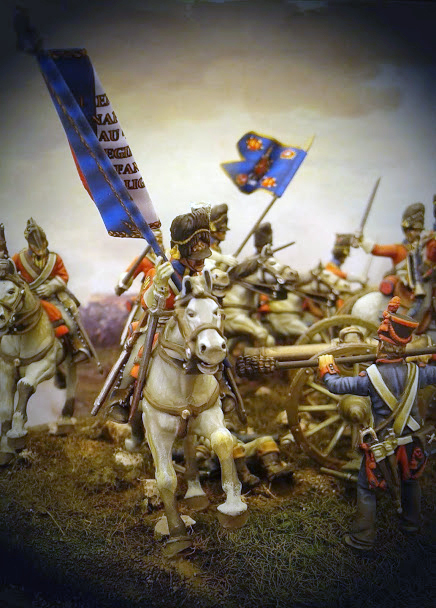 The post Spotlight: Luis’ Scots Greys Diorama appeared first on Warlord Games. Frontline Report: The Battle of France begins!